Two runs rolled into one post; one with a wonderful bike, the second with wonderful company. Let´s start with the latter: Thank you for a great day, boys and girls. 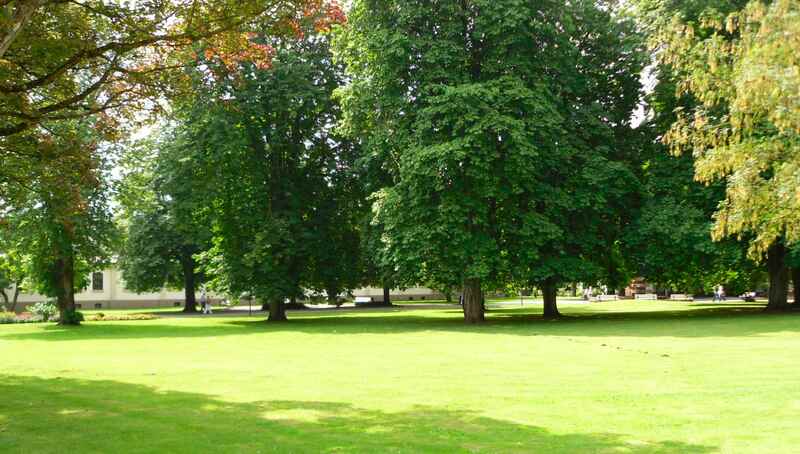 right in the middle of the town. There are sources of salt water which were formerly used to produce, you guessed it, salt, but are now an asset to the spa because of their healing powers. 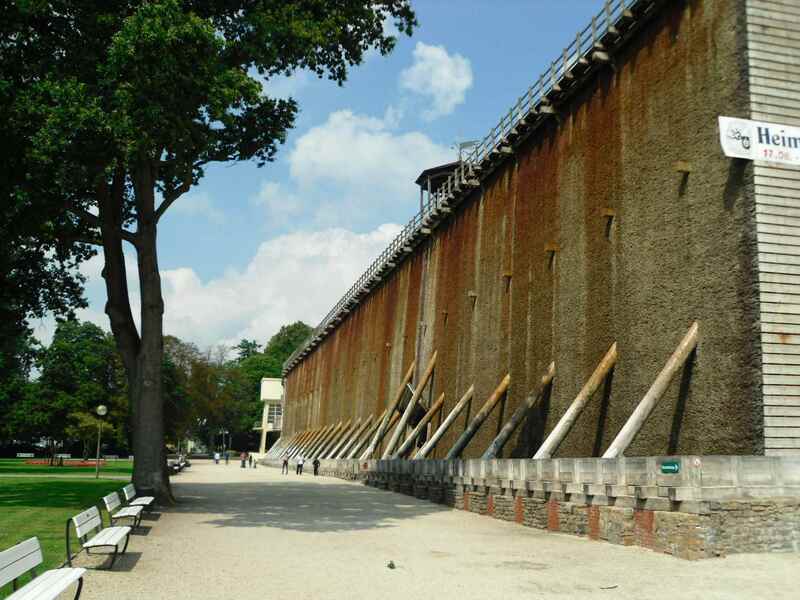 The Gradierwerk consists of a wooden structure covered in thorn bush branches, over which the salt water from the sources is poured very slowly to enhance its salt contents (from 5 “grades”, or per cent, to 25), after which the salt water used to be boiled until the water had evaporated and dry salt was left. Nowadays inside the Gradierwerk there is a room in which salt water spray is used for inhalation purposes, and of course the huge wall like construction is a tourist magnet; see the pedestrians in the background. The weekend before there was an absolute marvel of a bike (frame) in one of the runs. 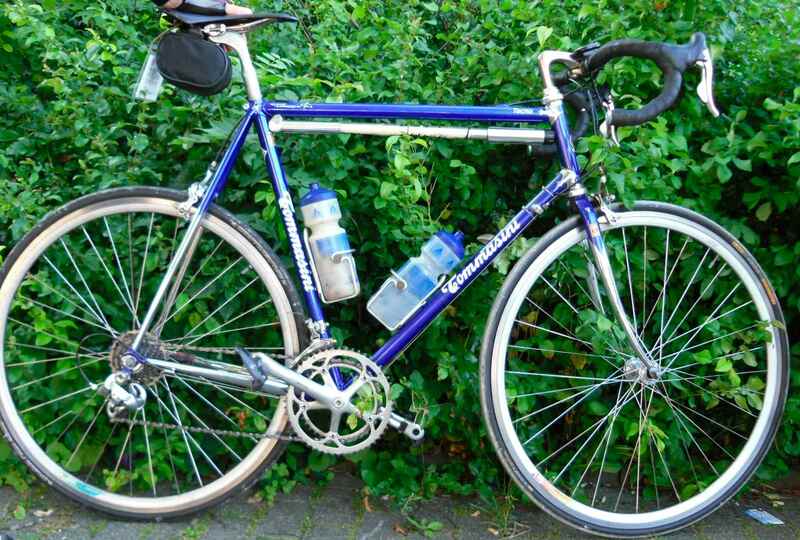 A local university student rode it; she had bought it cheaply some time ago for her fitness tests (she´s taking a PE teaching course). The owner promised to clean it and to be careful with it until she will sell it to me, whenever that may be. 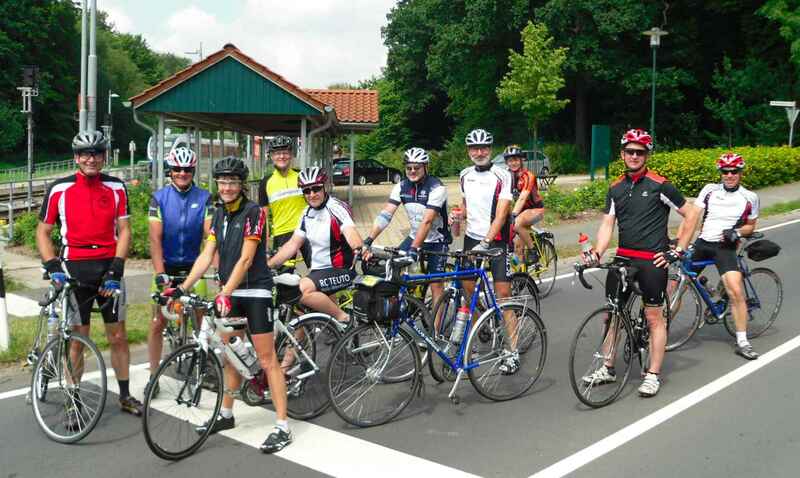 A fortnight ago there was a century ride in a place about 75km from here, called Buldern. 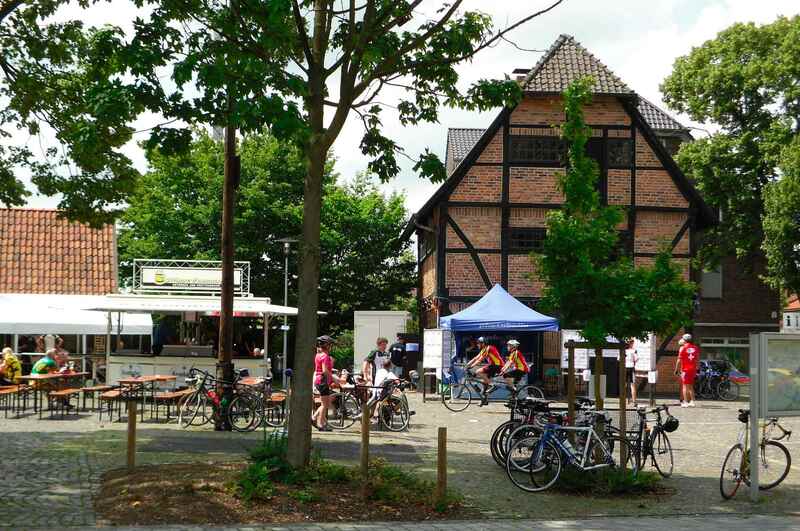 It´s in the vicinity of Münster. As you find them all over Europe, there is a nice central square with some old and not so old buildings. Usually starting places are in schools somewhere in the periphery of a town, but Buldern isn´t all that big anyway, so we started from the village museum and meeting place. If you look closely, you can discern the yellow Rickert from the previous post leaning to the village map in the bottom right hand corner of the photo. Also as you find them all over Europe, there is a monument to those who died in darker times. In Buldern, it´s big and right in the centre of the village. 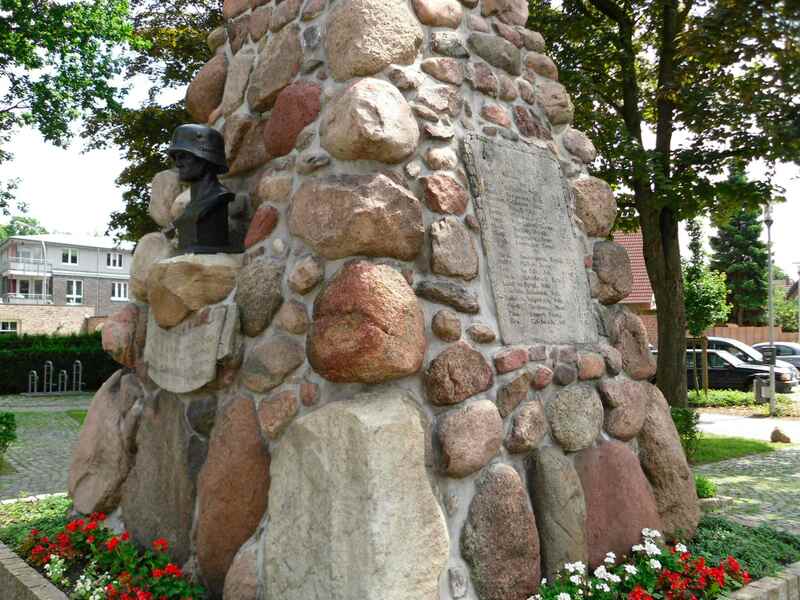 There are names of victims of three wars; 1871, 1914-18, 1939-45, all over the monument, with numbers of victims rising exponentially with each new war. So when people ran out of space, they used the ground at the rear. Buldern was a medium sized village, after WWII there can´t have been many men left. The helmeted bust dates clearly from the twenties, maybe the early thirties. 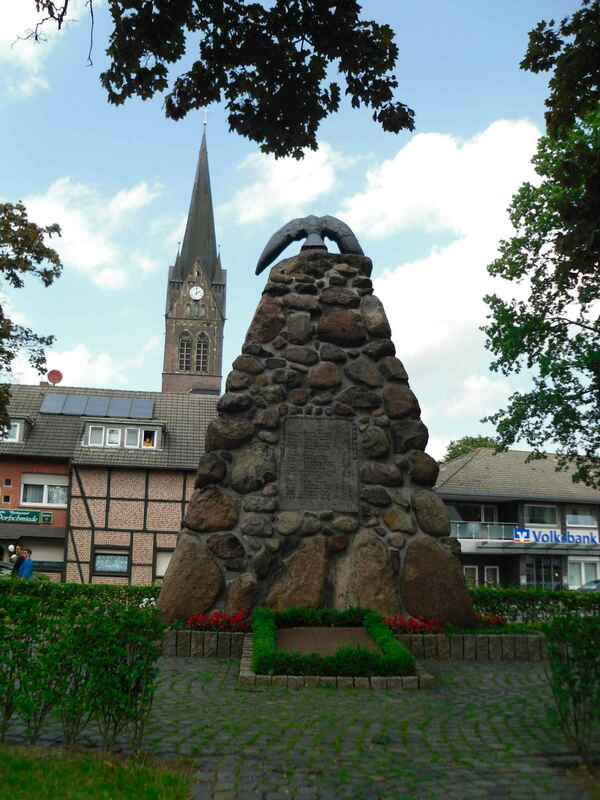 It was a time when the Great War was used in propaganda to prepare the German people for the next, bigger war, which, BTW, came to Buldern in the spring of 1945 when the Allied forces liberated Northern Germany. Buldern being the only place I know where a ride starts right next to a war memorial I thought it worth a mention, but now here´s two rather nice bikes. 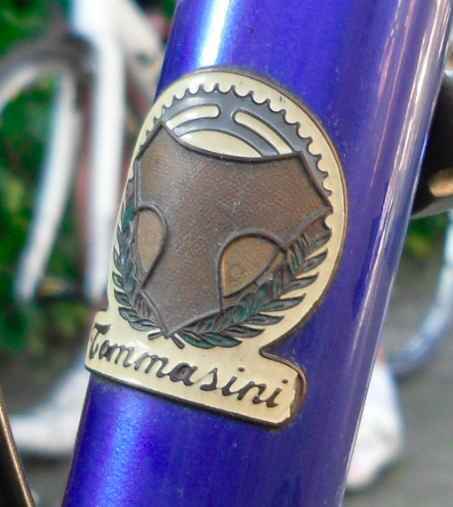 First a very pretty Tommasini. Next, there is a Sancineto. 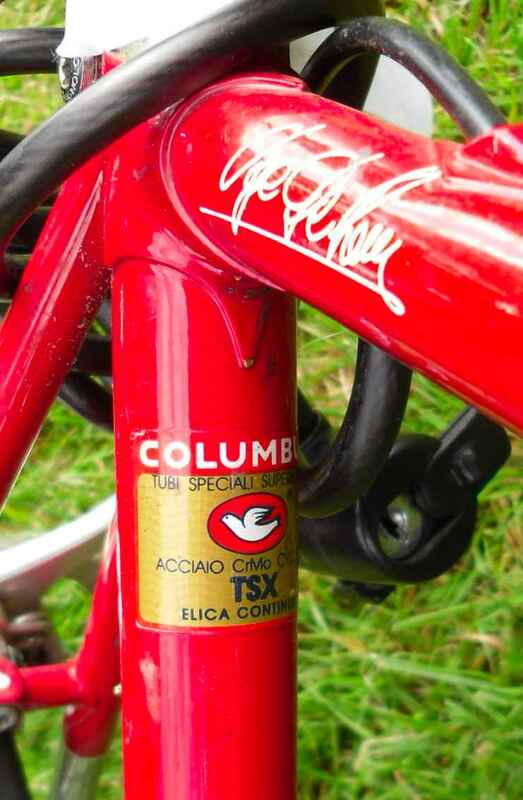 I must admit I have never heard the name, but the rear triangle/seatcluster treatment is remarkable. 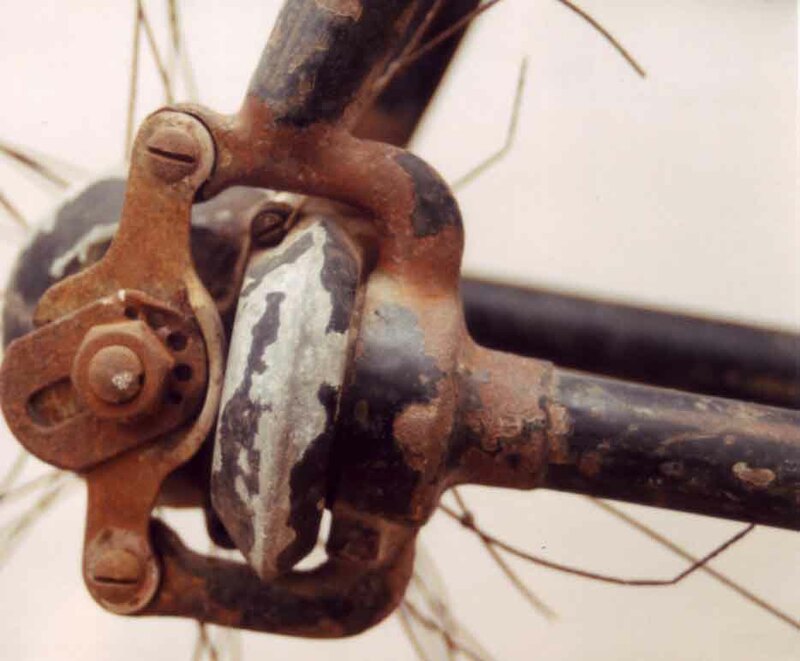 The quick release might serve a purpose, but it certainly is ugly. Another find from one of the century rides I did some days ago. I keep meeting the owner and his bike at rides, only that he´s much faster than I am, and so it was a good opprtunity to catch him before the start. 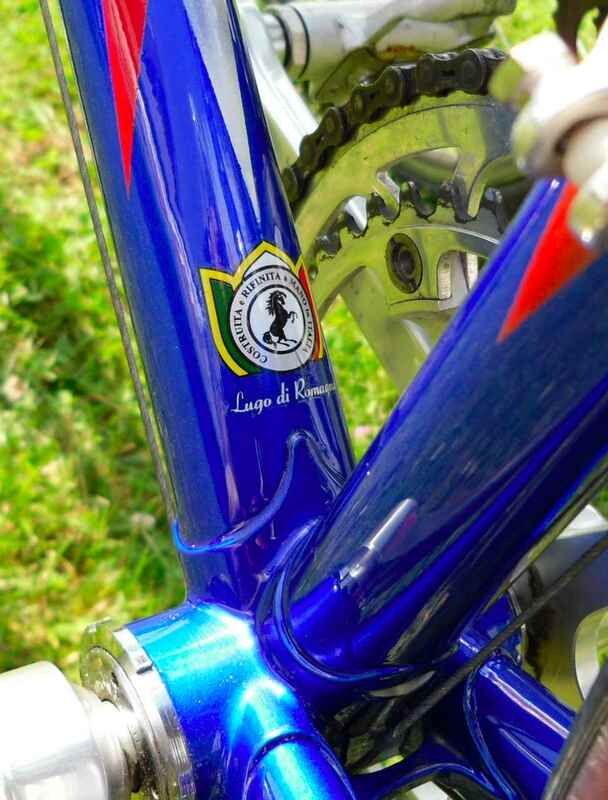 Apart from the chrome, the frame is built amazingly like mine. Not much comment necessary. Maybe the owner should have chosen a slightly taller frame size. 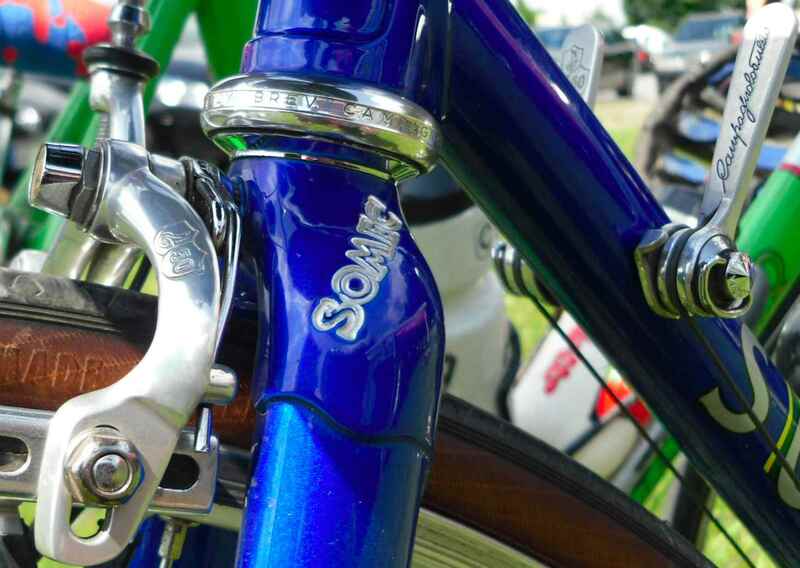 The brazed on and chromed “R” is a beautiful detail. 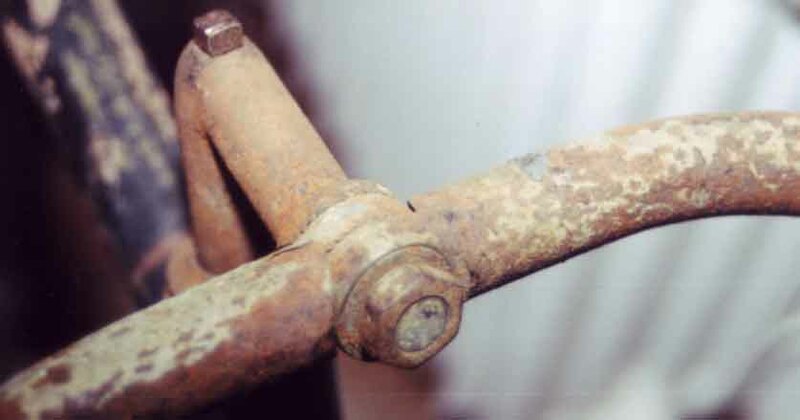 There is some rust on the seatcluster. 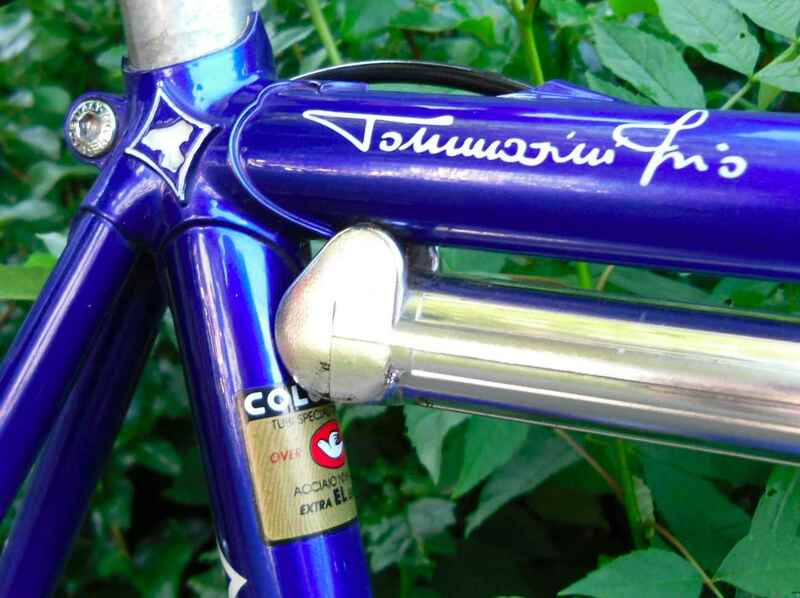 Also there is an oversized top tube, just like there is one on mine. 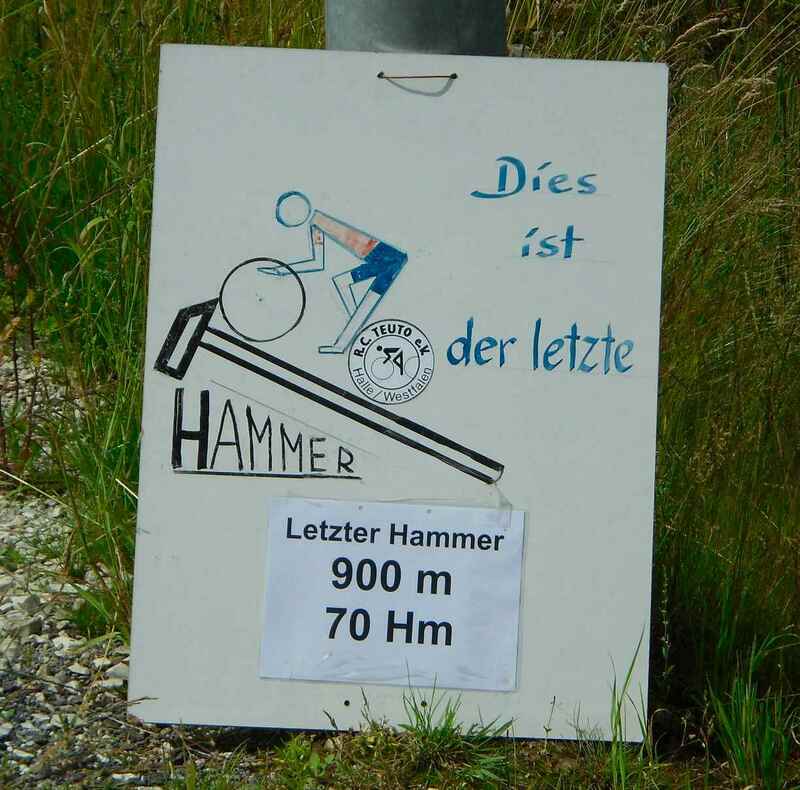 OK, the last hammer (= steep rise) going up 70 meters in 900, you´ll manage. 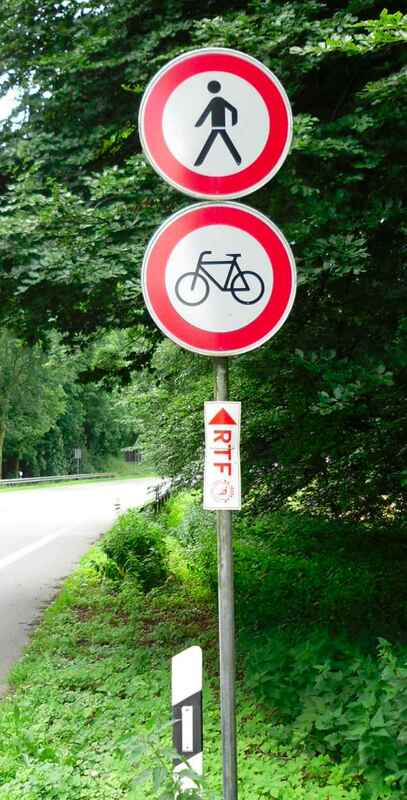 One more funny thing is that after you have ascended and decended it again, there is a road usually forbidden for cyclists, but today an exception has been made for the run. the owner of the bike comes by and yes, it is a complete 50th anniversary groupset, yes, with a black suitcase and a document stating a serial number, but no, it wasn´t expensive. 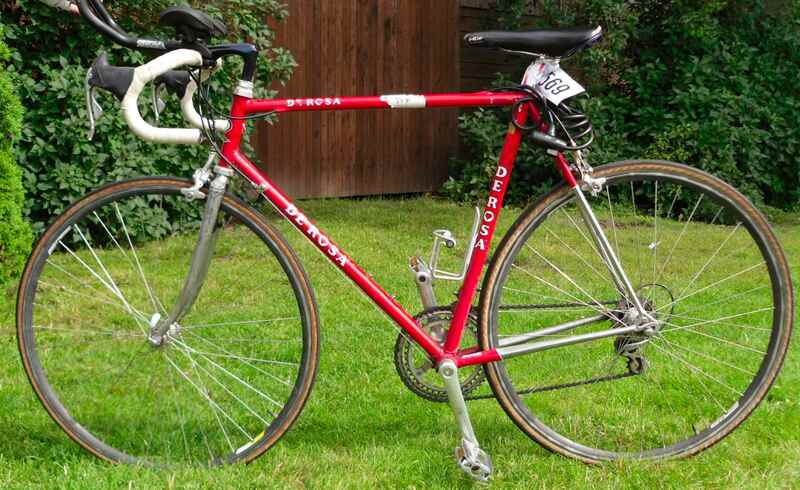 It had come from a pawnbroker´s auction, new and unused, and just at a time when the owner had wanted a racing bike. Ever heard of Bulat Okudzava? Singer-songwriter of the Breznev era who lived in Moscow? If you haven´t you should find out about him; he was great. One of his songs was about a paper toy soldier who died heroically when he tried to save someone from a fire. 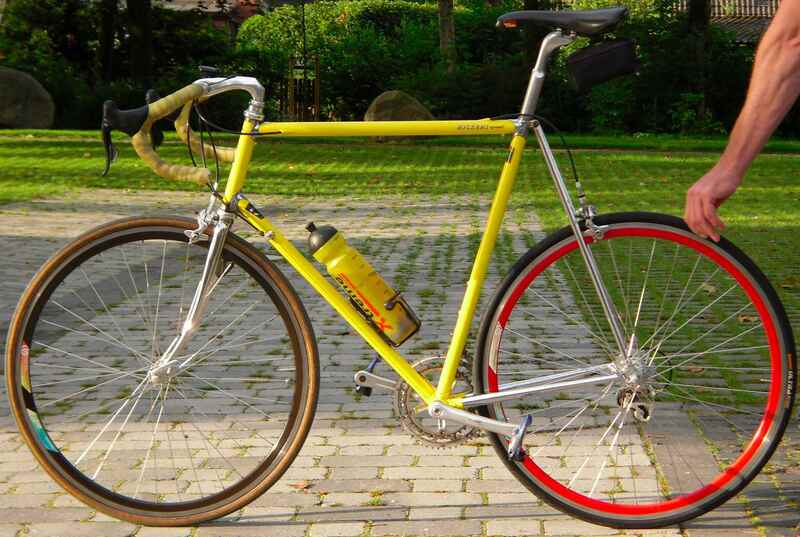 It´s anyone´s guess who a modestly dissident Soviet songwriter meant when he wrote the lyrics, but in the case of my little paper cyclist there´s no question about anything besides selling a long forgotten bicycle gearing system, and no political intention at all. Some ten years ago I found this sweet little pub item in a French antiques shop when on holidays in Normandy. 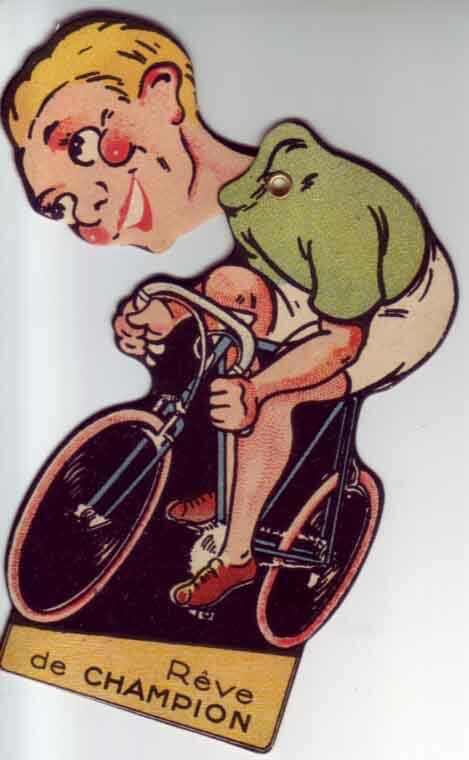 The weird thing is that there is a little copper rivet linking the neck to the jersey, and the littler paper cyclist can move his head, from a very relaxed stance to an aggressive, scorcher one. OK, there´s still the somewhat artificial smile, but never mind. The words mean “the champion´s dream”. 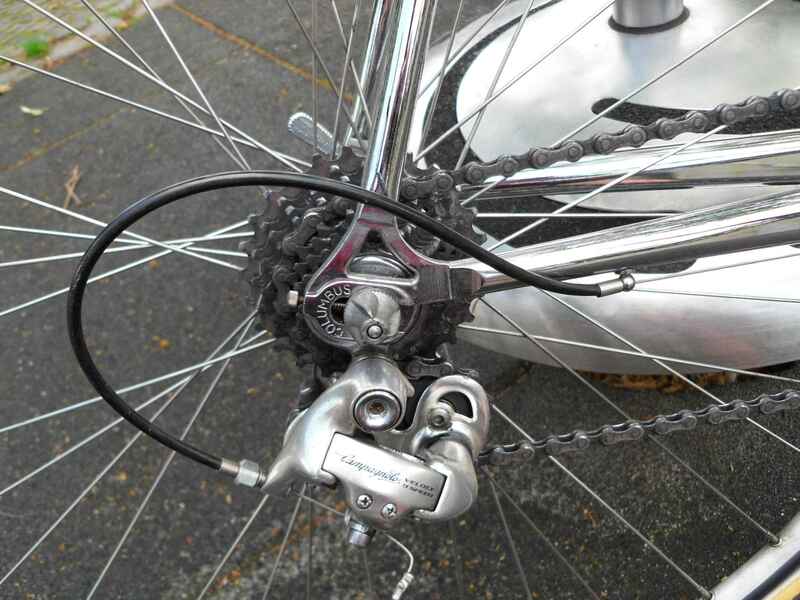 Here´s the translation: Look at… the “2 Velectrik”, the derailleur without cable and the new super powerful brake. 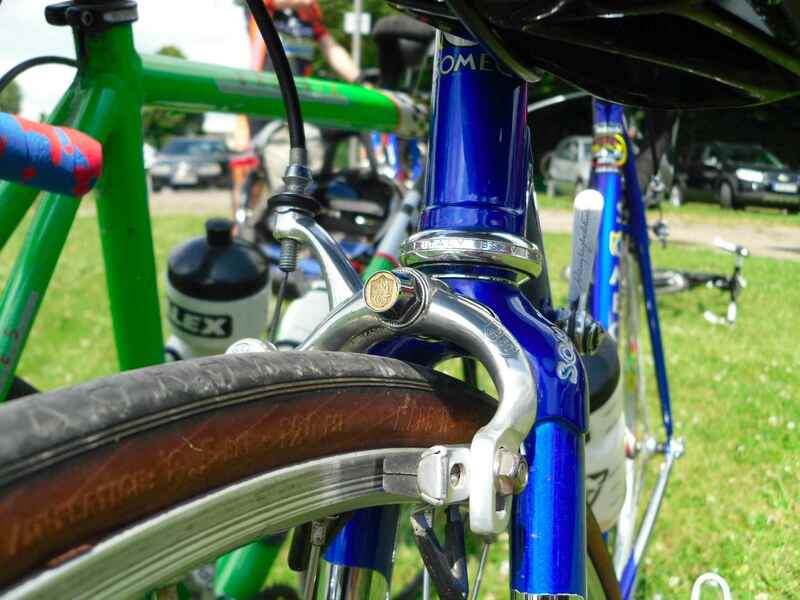 Infos: Cycles “B.G.A.”, and the St. Etienne address. Free price list, it says, and consult our agents. 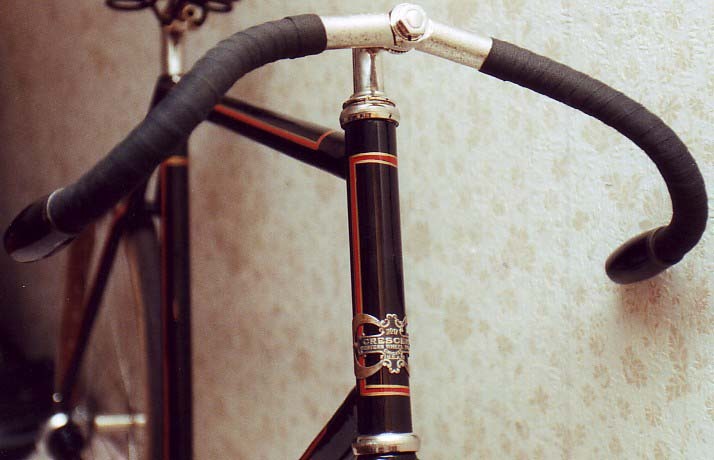 St. Etienne was France´s centre of bicycle production in the thirties when this little item was made. 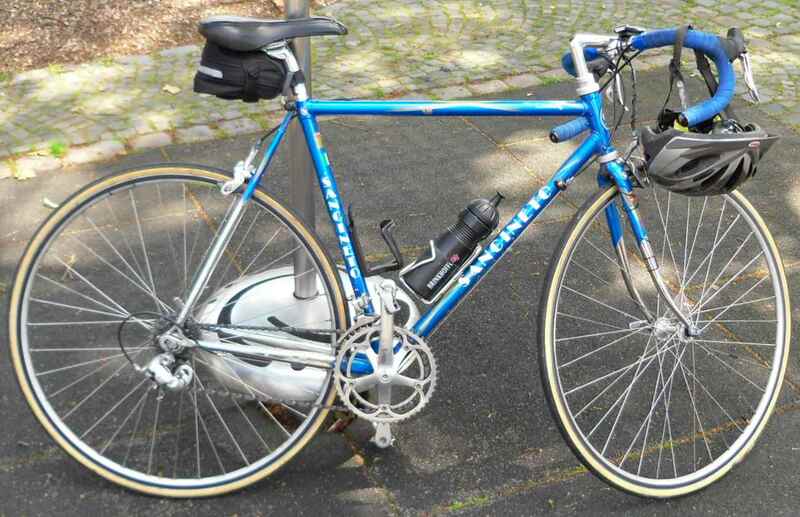 I have been sent some photos of a Velectrik equipped bicycle by Claude Boelens from Belgium (see comment). I really like the very elaborate paintwork restoration. Look at the multicoloured actuating lever knob – a lot of work. 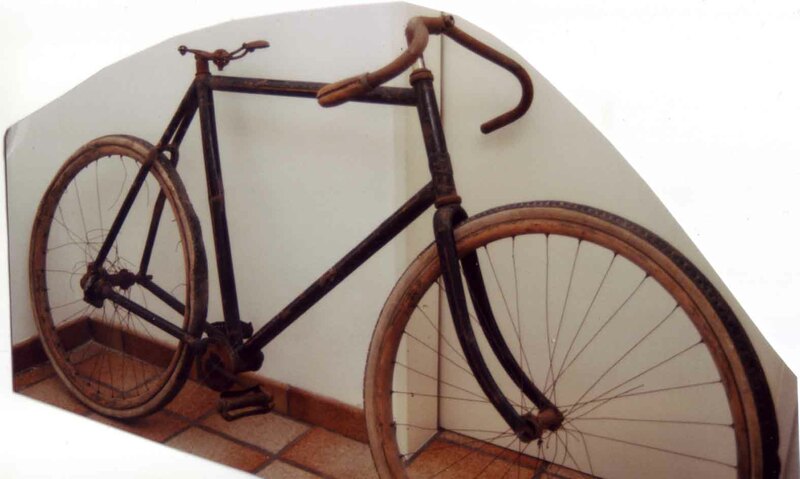 After having posted so much about relatively modern bikes, I feel it can´t do any harm to present the oldest bike in my stable, my 1899 Crescent No. 17. In November 1999, there was a traffic jam on my commute. I chose a different route and came across a cycle shop I had not visited before. 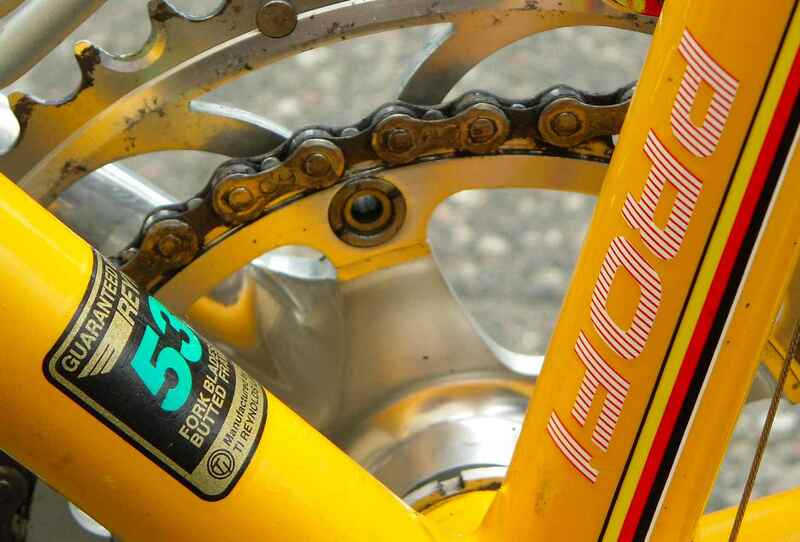 My standard question in those cases is of course if there´s an old racing bike somewhere among the used bikes. The man in the shop said there was no racing bike in the used bike rack, but there was one in the cellar. So down we went into the badly lit caverns (please make a mental note of the cellar being badly lit) of the age old house, and there it was, a frame of a very old bike, badly damaged, nothing on it, not even a chainwheel, though the cranks were there. I was disappointed. 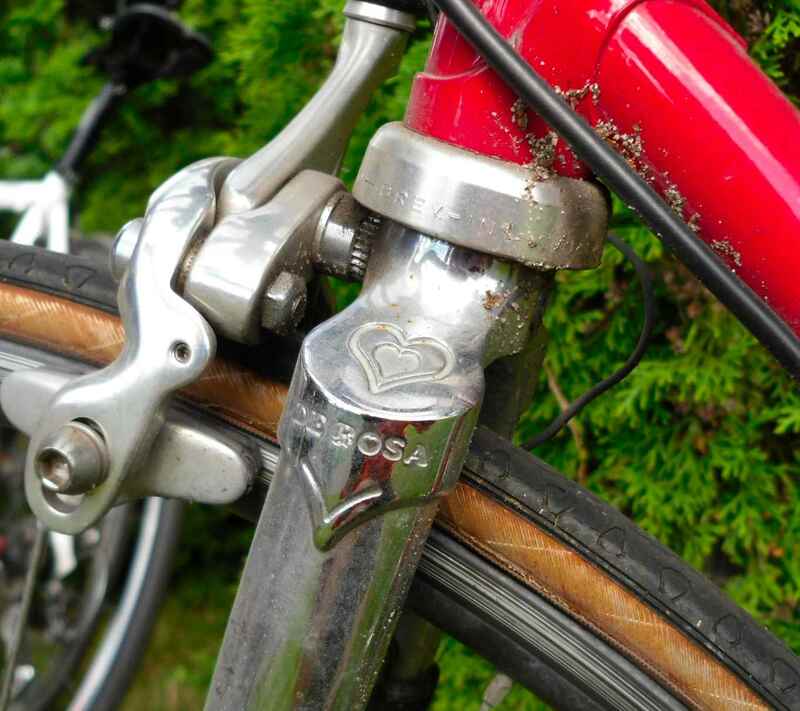 However, the chap said that when the bike had been left by a customer some years before, it had been complete, and would I want to have a look around. Do you still remember Apple II computers? And if so, do you know the “Mystery House” game? I felt a bit like I was in that game, with the light getting less and less (You did make that mental note, didn´t you? ), and me keying in “go door” or “open box”. 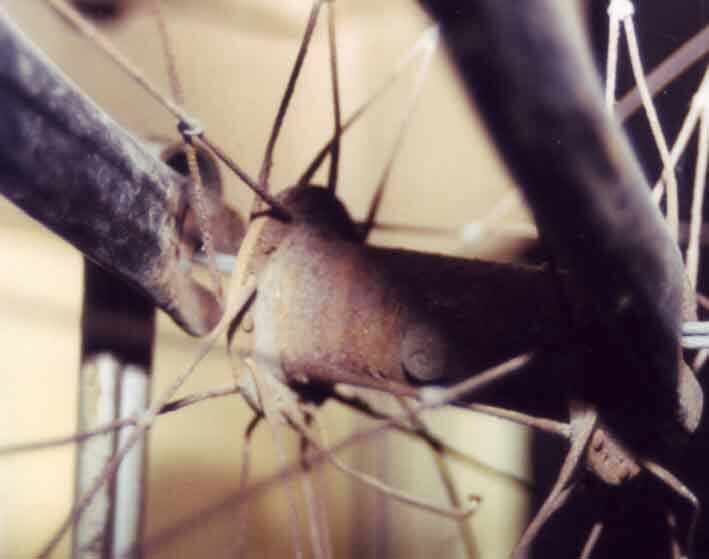 However, after some 30 minutes search I had more or less assembled the sad remains of a very old bike, wooden rims, Kelly bars and all, but the chainwheel remained elusive. I decided to call it a day as neither the chainwheel nor the chain, for that matter, would turn up; no “search cupboard” or “go next room” had helped. 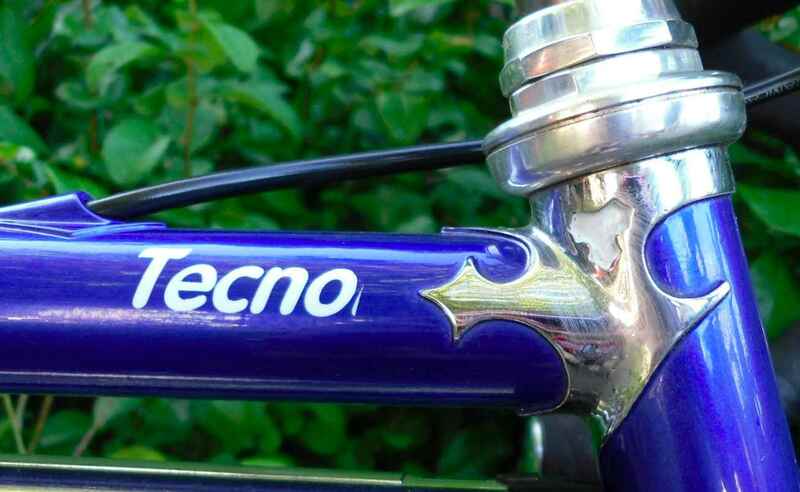 Anyway, after ringing the owner we agreed on a price of 200 Marks, and off I went, wondering where I could get the spares for my chainless bicycle. 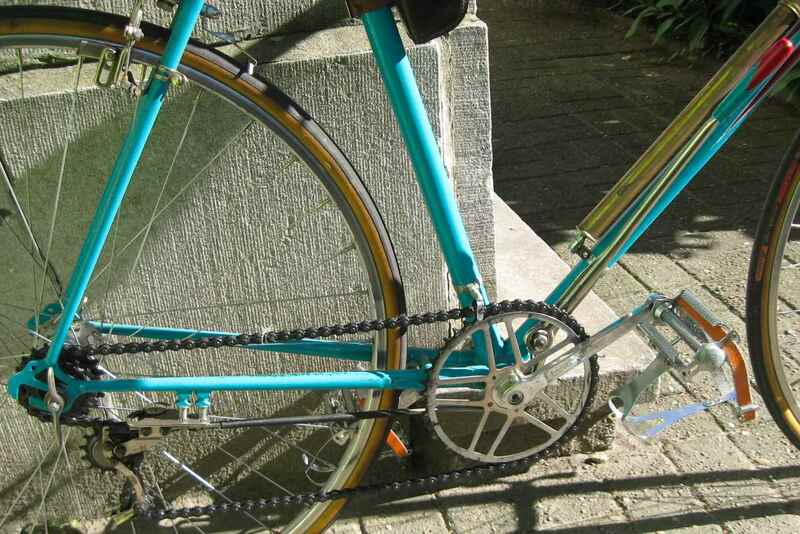 At home, in better light, I found that the bike was exactly that: Chainless. A Crescent No. 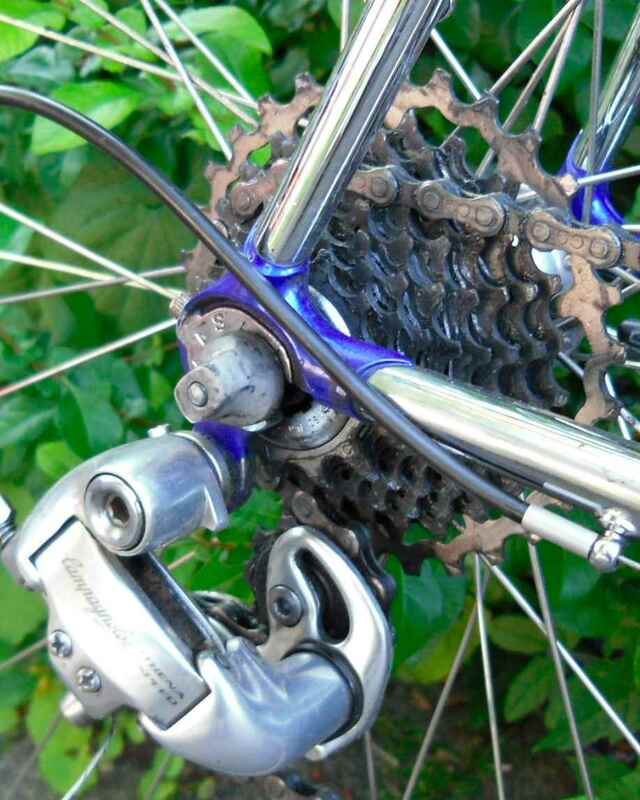 17 bevel gear drive chainless. Bingo. 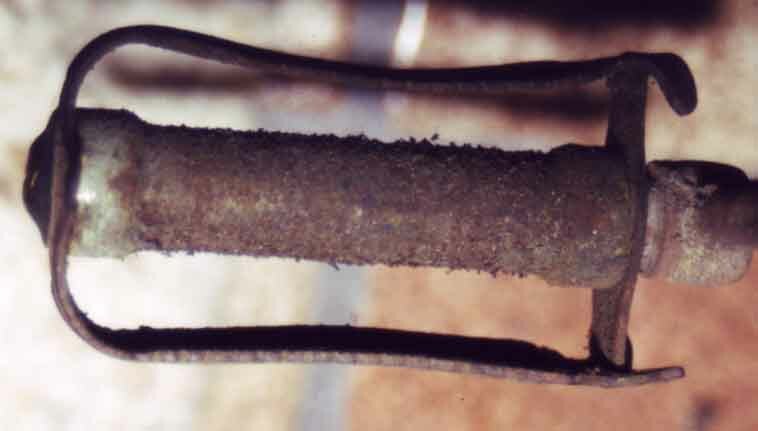 Note the crack where the down tube meets the b/b shell. 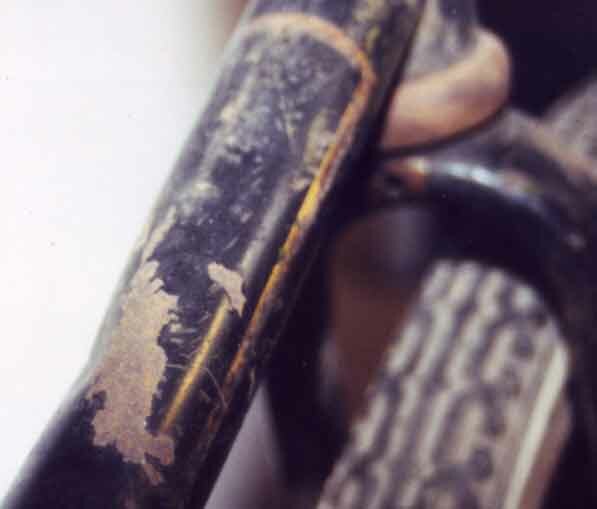 Here´s the dent in the down tube. 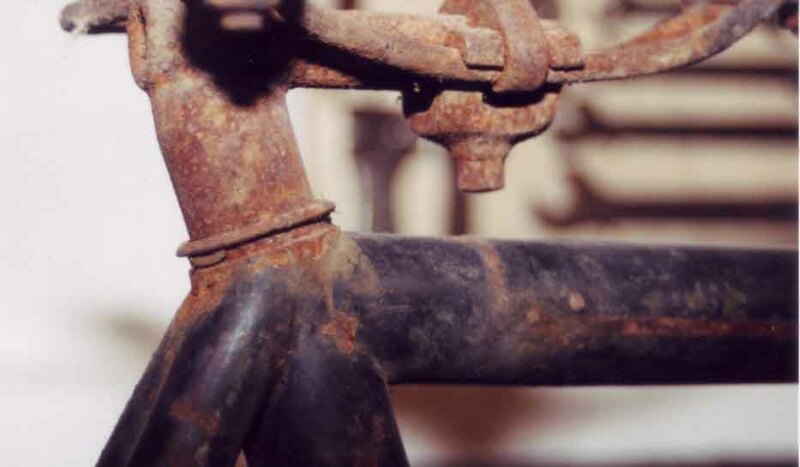 The frame actually was bent in two dimensions and would turn a corner with the bars straight. … had it been anywhere near straight itself. This motheaten something was one end of the handlebars. This was the center of it. 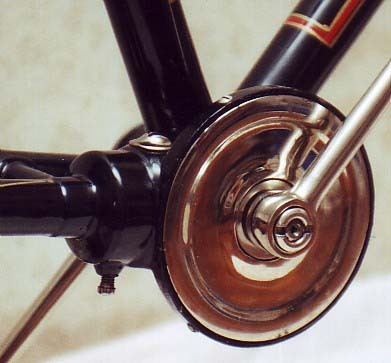 Nice Kelly bars with a locknut in the middle keeping the serrated bar centres from un-serrating during the ride. You could choose many dozens of positions varying from super scorcher low down to happy go lucky upright. Nice idea; wonder why we can´t have the bars today. 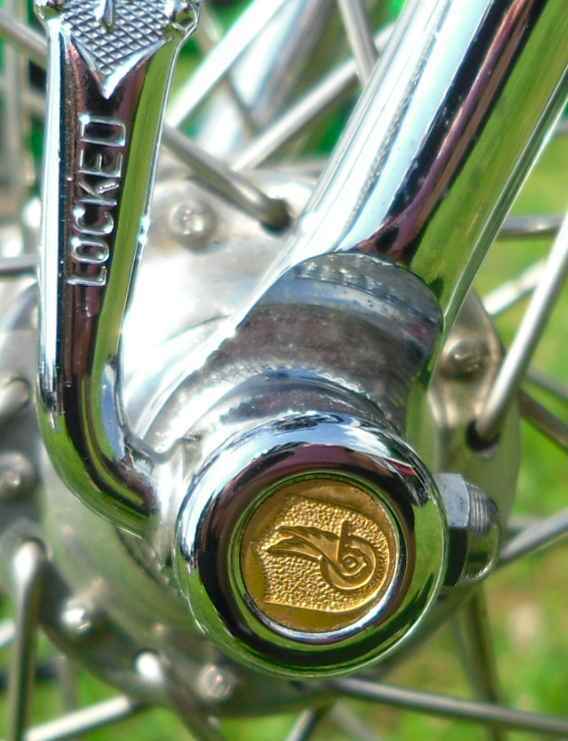 You can actually still read “Kelly” on the locknut, even after re-plating. This mangled something was the centre of the seattube. I think had they had tanks in 1899, they would have run one over the bike to make the list (horse carriages, trams, pliers) complete. And this was everything that was left of the saddle. 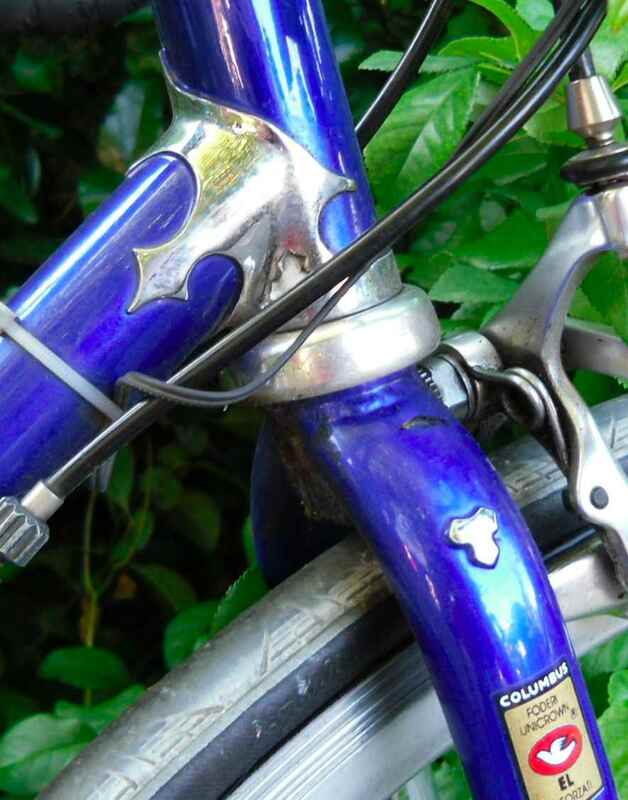 Unbelievably, neither the handlebar extension nor the seat tube were stuck. They just slid out of the frame after loosening the internal clamps which, BTW, makes for a very smooth seat cluster. 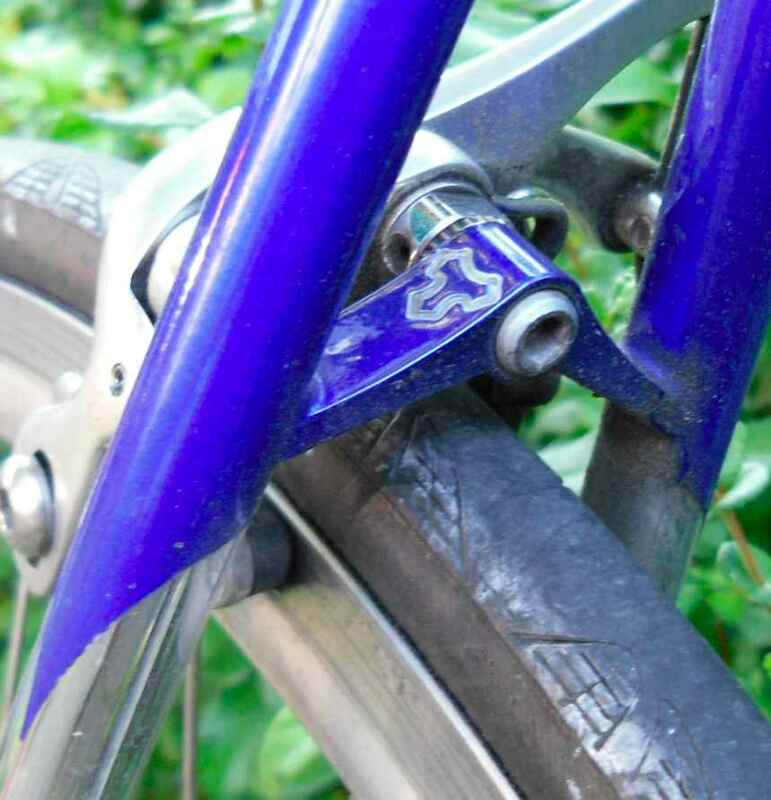 This was the rear triangle. I think it must have been out of true by about 20 degrees. 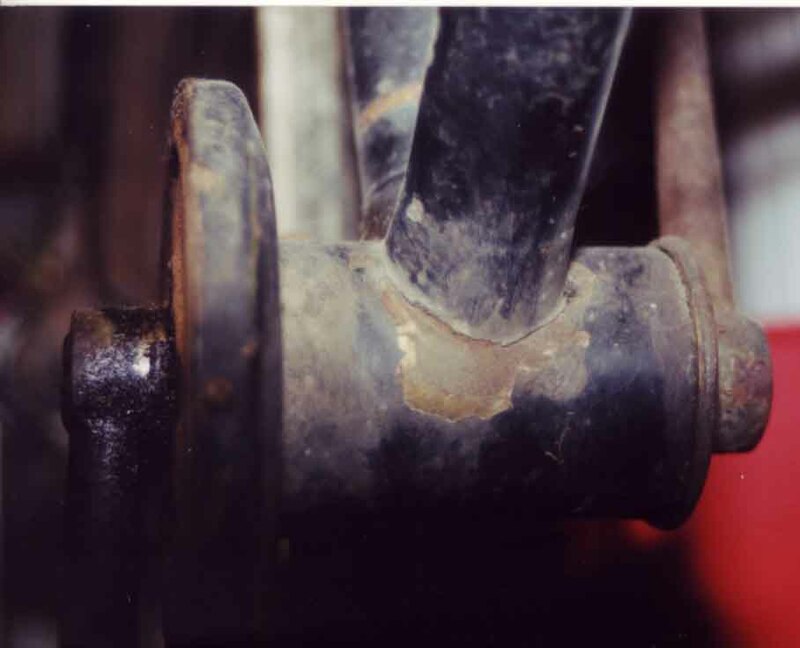 The damage to the seat l/h stay. Luckily, all of these parts were still there. When hunting around for info I had two people in the States making me offers for the bike because of the alloy bevel gear covers alone. It still turned, and the bearing cap is the same item as the b/b gear inspection cover. Amazing. Here we are, one undamaged part. 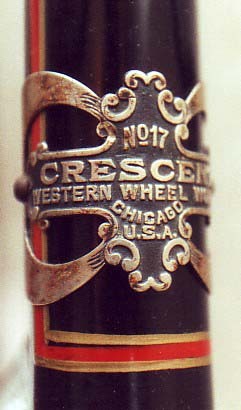 Nice double crescent Crescent badge positioned in the typical Western Wheel Works low down position on the headtube. 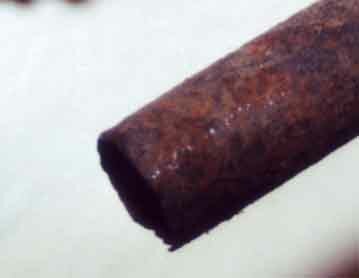 The remains of the lining, very elaborate, and extra. 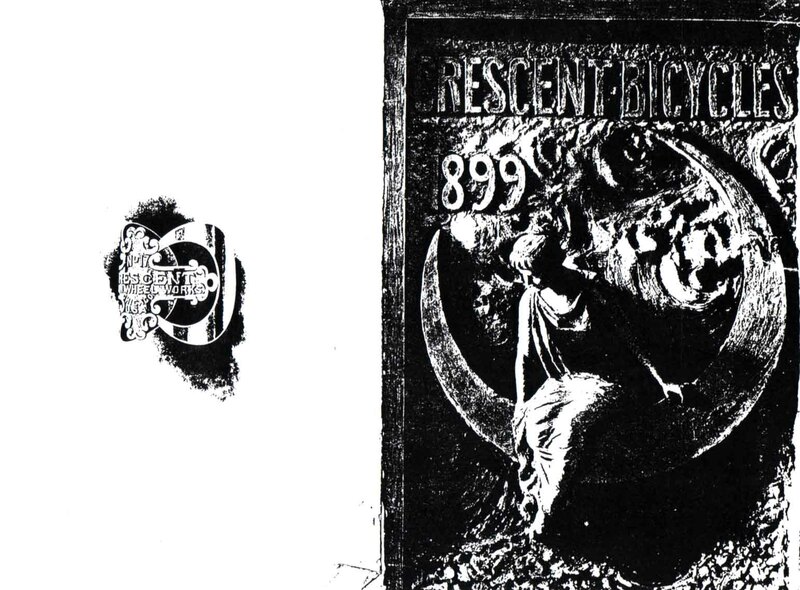 Neither lining nor Kelly bars were in the 1899 Crescent catalogue, of which some scans further down. 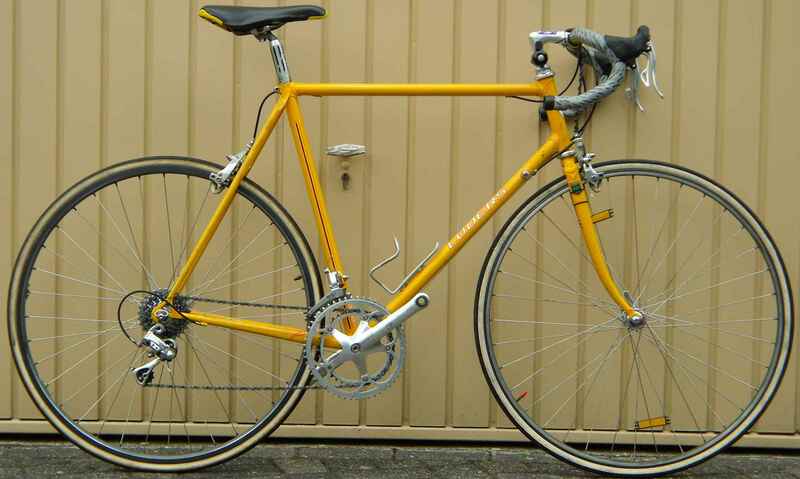 Someone bought the most expensive bicycle in the shop and then spent some more on it. Amazing. 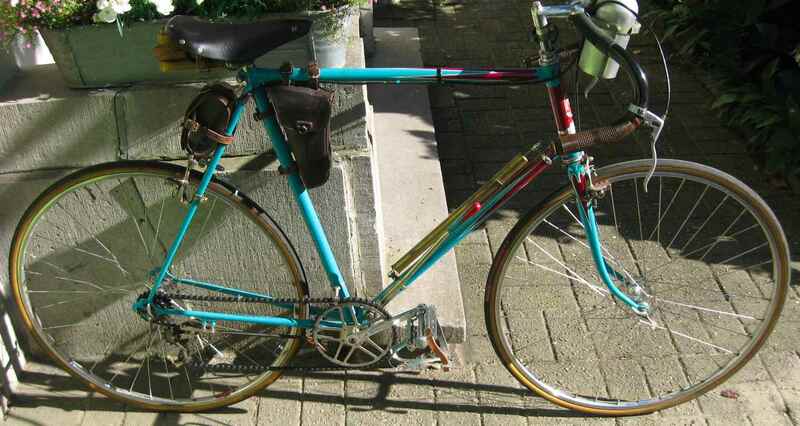 And this is what Tim Gunn made of the bike some two years later. 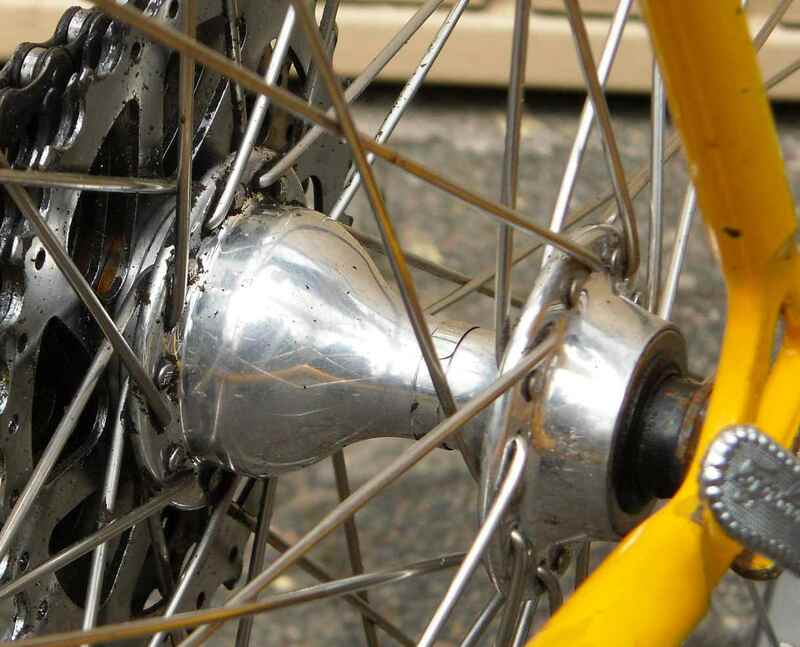 He did a complete tube by tube disassembly – repair – assembly job on the frame, made some spares for the mechanicals, and made the platers do such a great job that all the finery on the nickel parts is still there. OK, there were some hiccups in re-plating, but the final result was wonderful. 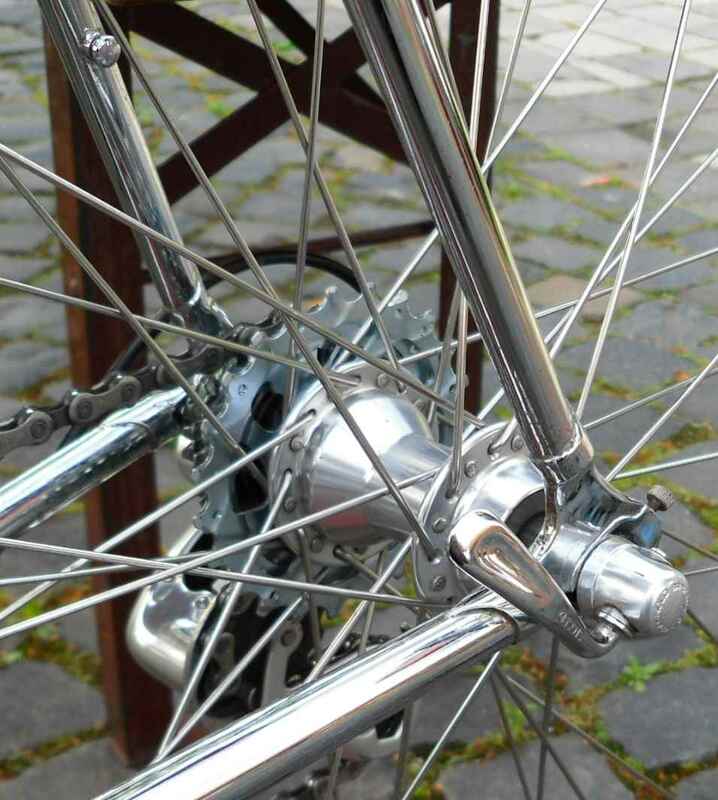 The rims are now wire ons which came from Velo-Classic. There were raw and undrilled so I could accomodate the 36/32 spoke count and varnish them in a rosewood colour just like the original spec as per the catalogue. 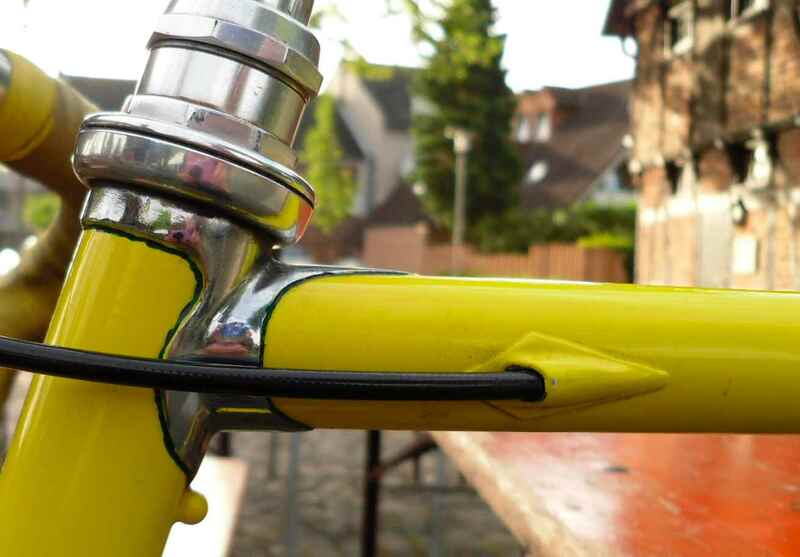 The lining was done by Velo-Classic here in Germany. They also did a marvellous job. 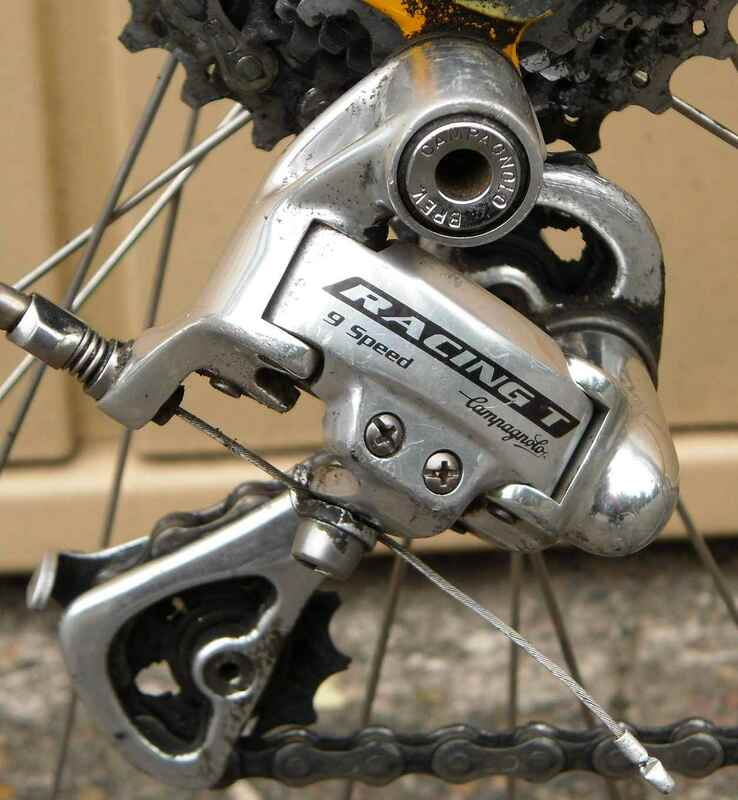 Tim fabricated the – no, not the chain tensioner, but the thingy which looks like one. 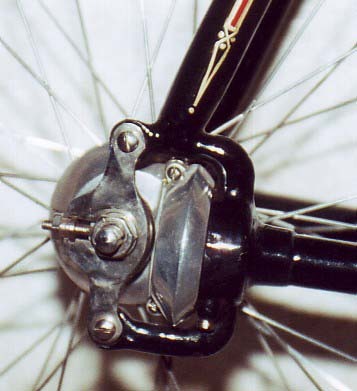 Note the inspection cover on the drive housing which could double as a pedal cap. And I restored the headbadge – took a Dremel with a rotating brass brush to it and dremelled away. The dirt went up in a small cloud, and the black etching stayed on. Sheer luck. 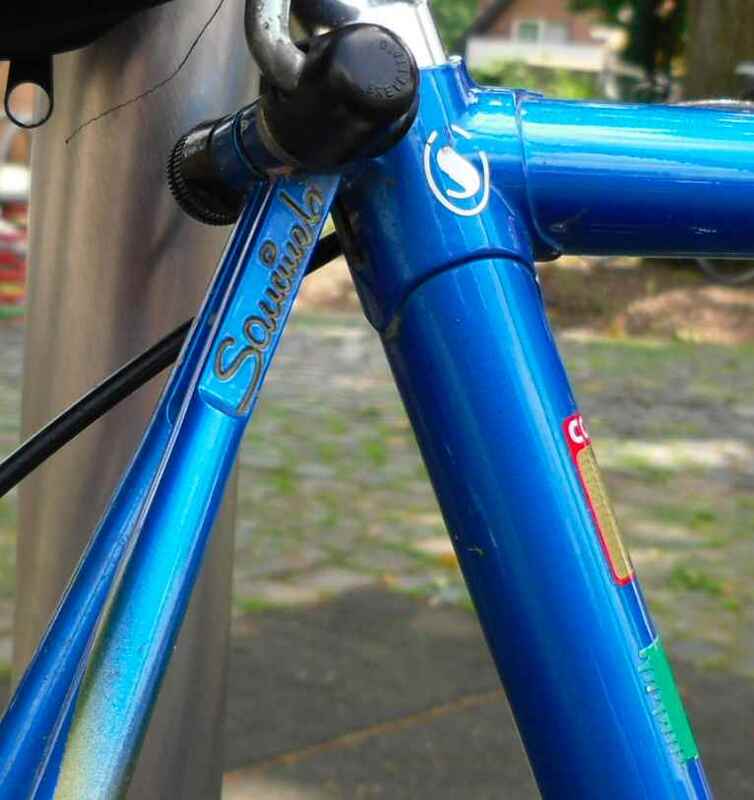 The handle bar bars couldn´t be polished before re-plating – they had rusted too thin, so I put some tape over the pitting. 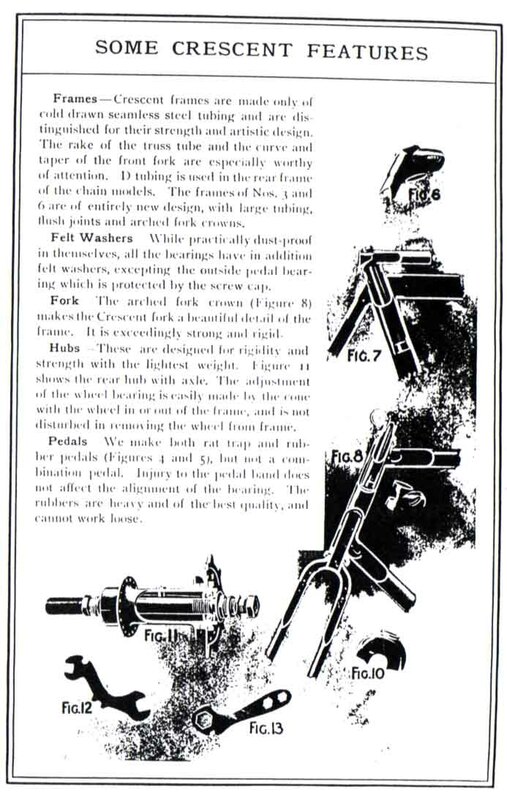 And now some scans from the 2nd generation photocopy of an 1899 Western Wheel Works, Chicago, Crescent catalogue. This is what the frame looks like form the inside. Some blurb from inside the catalogue. 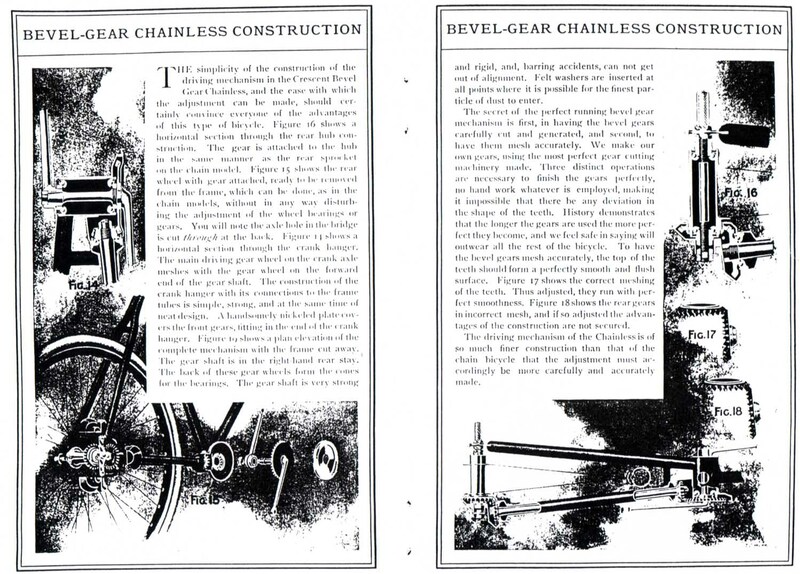 The chain drive No. 15 cost $35, the 17 cost $60. 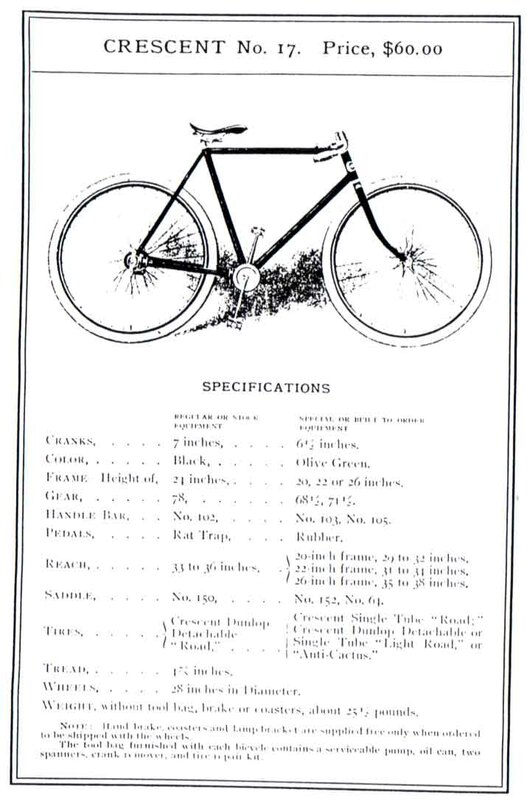 These figures reflect the price war being fought at the time: Only a few years earlier a chain driven quality bicycle would have cost around $100, if you can believe Pridmore/Hurt in The American Bicycle. Three years later, Western Wheel Works, huge as they were, went out of business. The restauration took me three years and a whole lot of money. I kept all the receipts, and the last one is for the rear wheel spokes, dating from August 2002. How does the Crescent ride? Well, the gear makes a lot of noise when under pressure, but that is to be expected. The bevels don´t show any wear, it must be the construction. 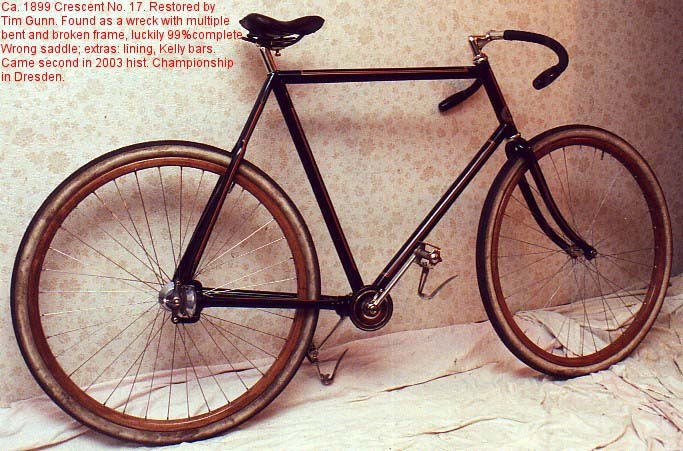 Fixed gear, of course, but I don´t mind that. 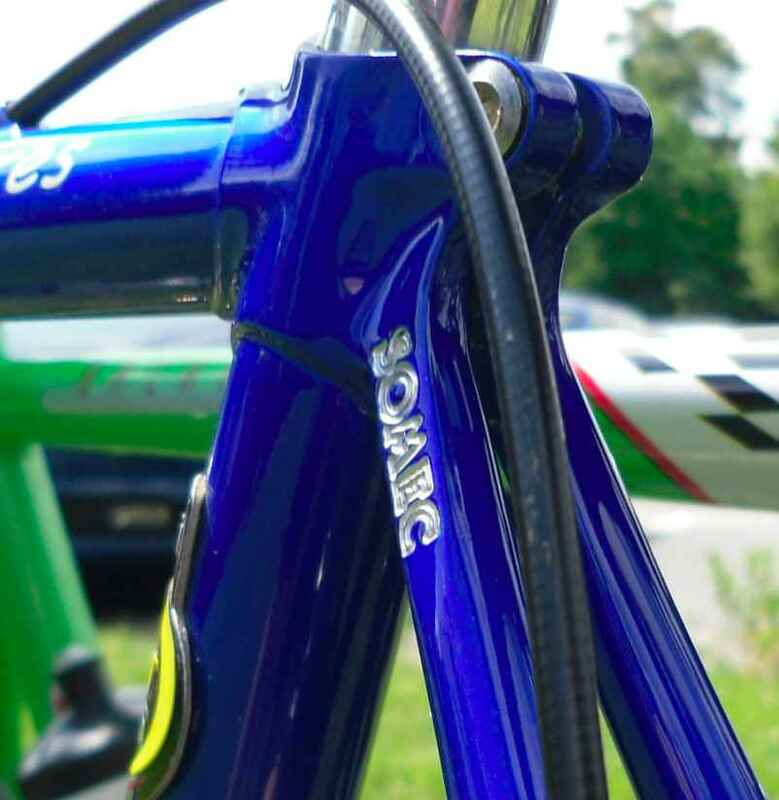 It is a sturdy, solid feeling frame and it goes where you point it even at speed. On a fleamarket I found a number of vinyl discs some days ago, among them Hannes Wader´s 1974 Plattdeutsche Lieder, (Low German Songs). Having grown up in the sixties in a high German speaking family, but in a village where native speakers of Low German abounded, I can understand a lot of the lyrics on the disc as the dialect Waders uses (grew up in Bielefeld, but learned a Northern German dialect later in life – a bit artificial if you ask me) is roughly similar to the one I know. un de Krei, de kreeg een van de achterste Been” and the crow got one of the hind legs. That´s basically what I busied myself with on Sunday afternoon, taking both the crow´s and the fox´s parts. 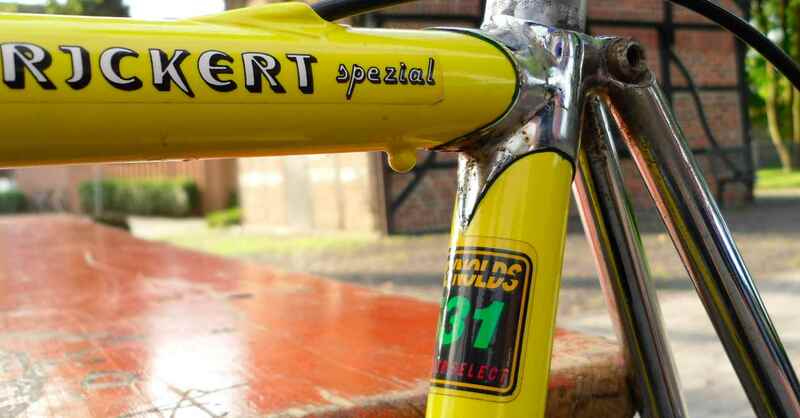 Lütt Matten was played by one of the recently acquired Lüders bikes. While the bike hadn´t tried a wheelie it still had been so vain as to pretend to be a nice racing bike. 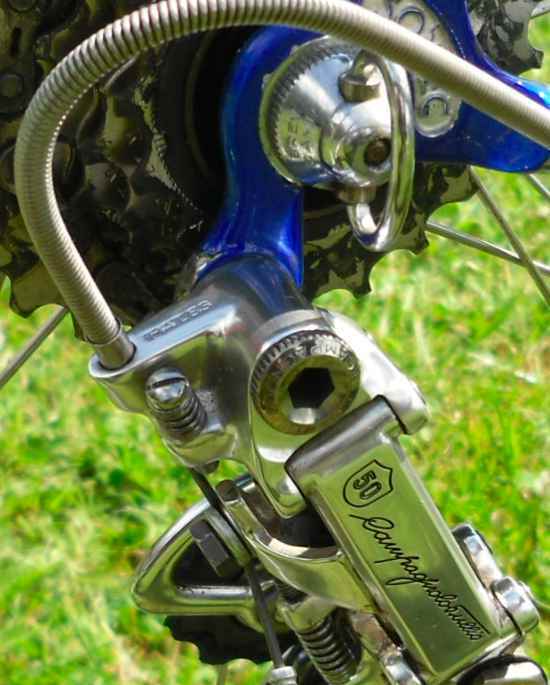 First, the frame still retains its original 126 mm rear dropout width while sporting Campag 9 speed parts requiring 130 mm. 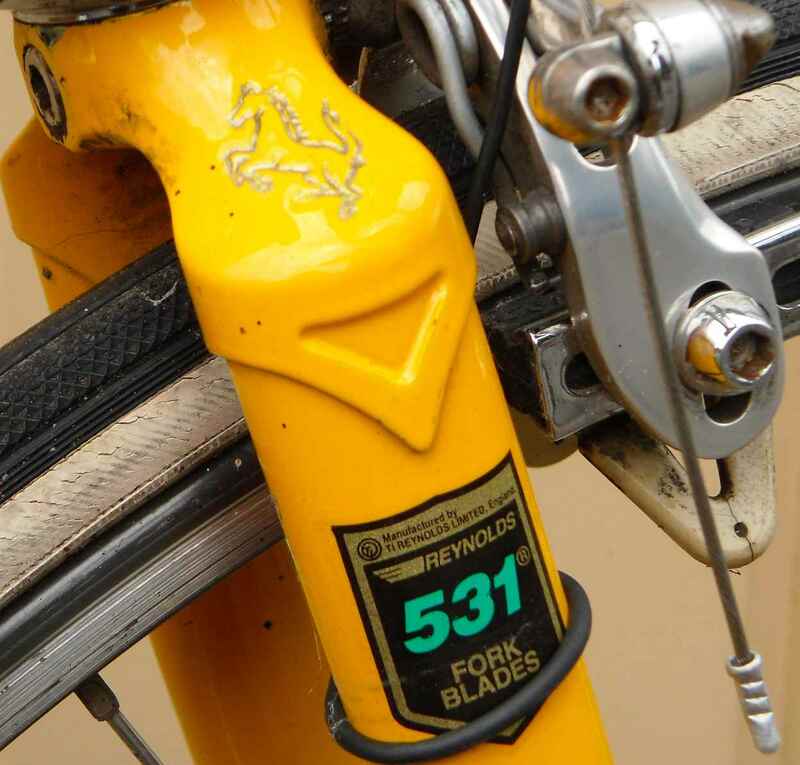 Next, there was no complete groupset, but a mixture of Veloce, Racing Triple, older Chorus and very old Super Record. 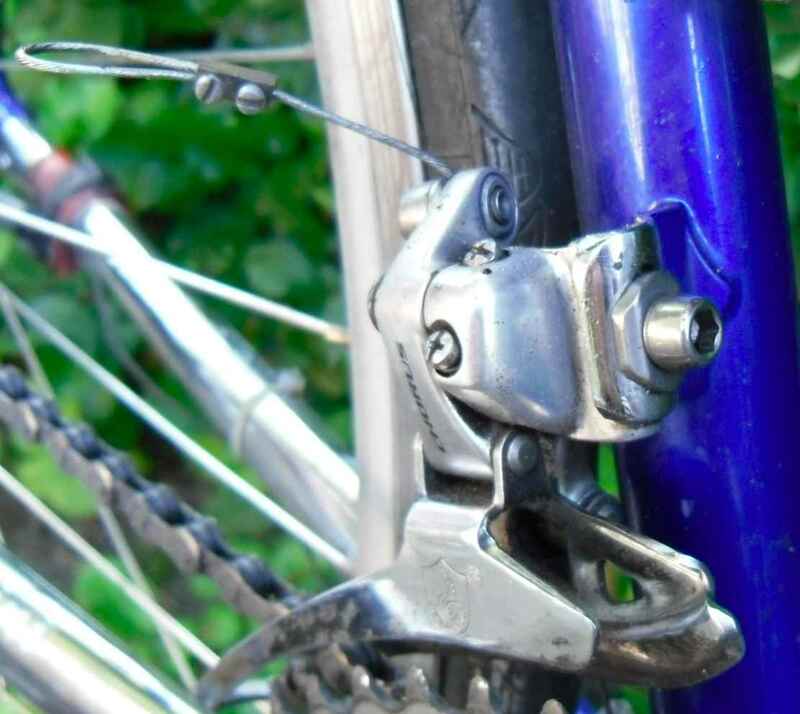 Also there were some really horrible bloopers like confusing brake and gear outer cables, having the rider running the risk of bursting a gear outer with the brake inner inside when braking hard and needing the brake most. 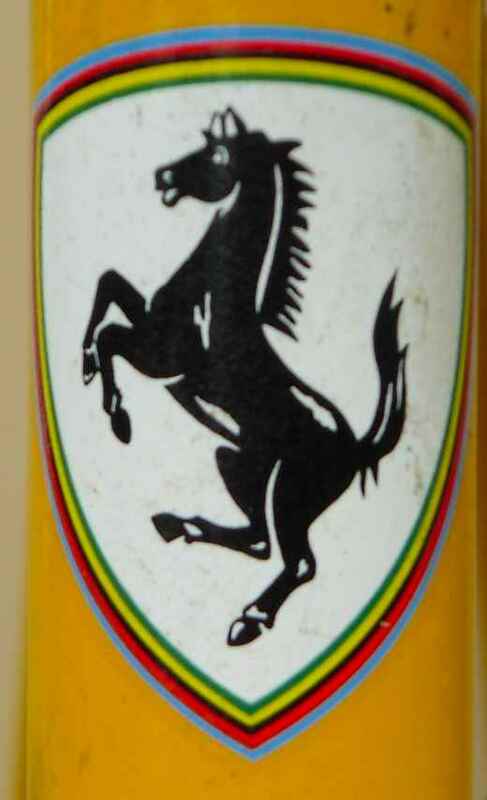 Makes your hair stand on end. 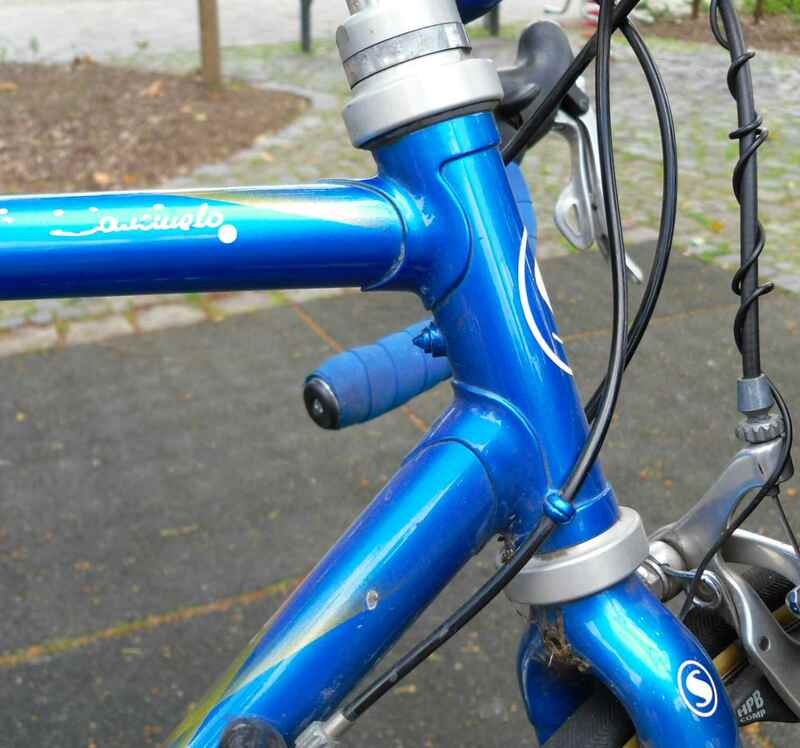 As the paintwork hadn´t survived too well, I decided to give the bike the chop and sell on the frame and those parts I can´t use, which has since happened. 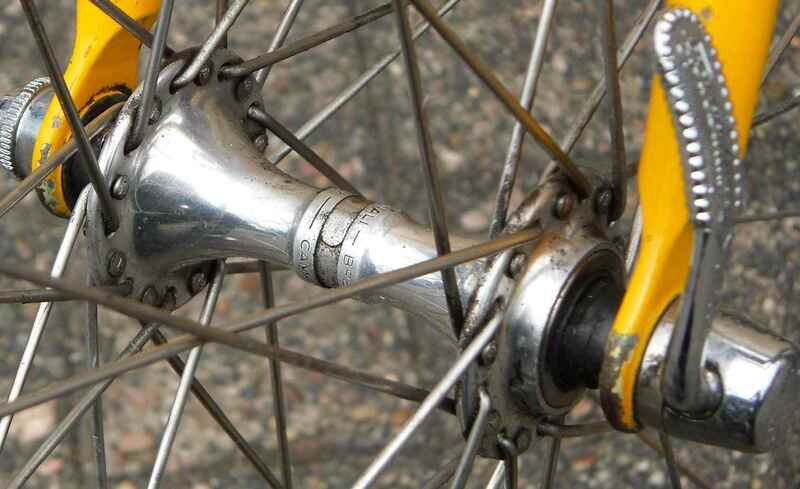 I have also used the Edco Competition b/b bearing for my Ellis Briggs Randonneur. This is a definite inprovement over the old and somewhat shaky Veloce cartridge. 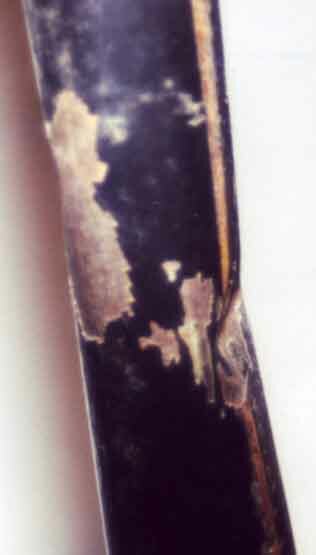 Here´s an example of the paintwork. Just like the red one. Something that went into my box; it´s Record, I think. 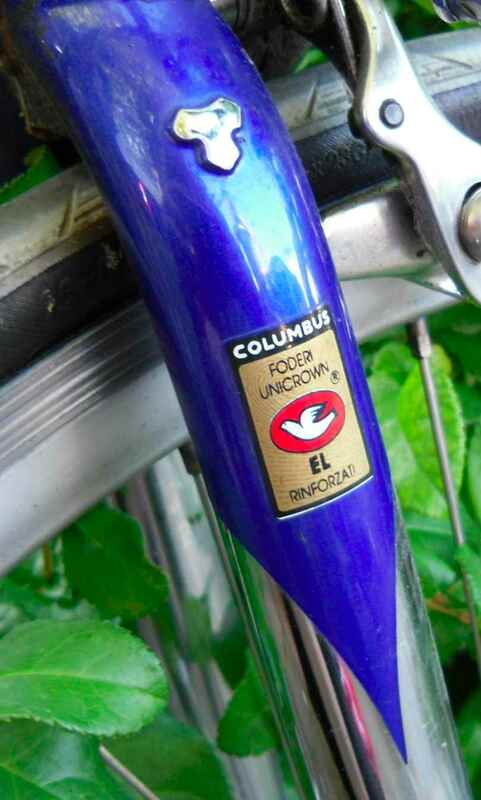 This will also go onto my Ellis-Briggs Randonneur very soon; it will replace the inferior Veloce unit. Have to clean the road rash up, first, though. The brifters also were good, they also are spares for my son´s and my bikes. And something else for the spares box. 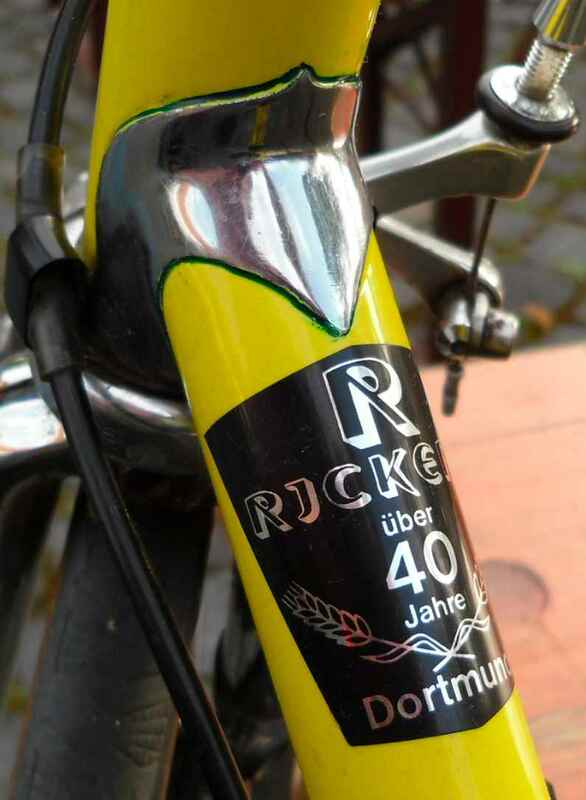 So, all in all, having had the yellow Lüders for a few weeks (the red one will stay until further orders) and having been able to explore Lüders history as far as I got was a nice experience plus the Lüders will leave traces on the bike I use most as well as in my spares box. Success. Oh, re little Matten: In real life I´m a vegetarian.